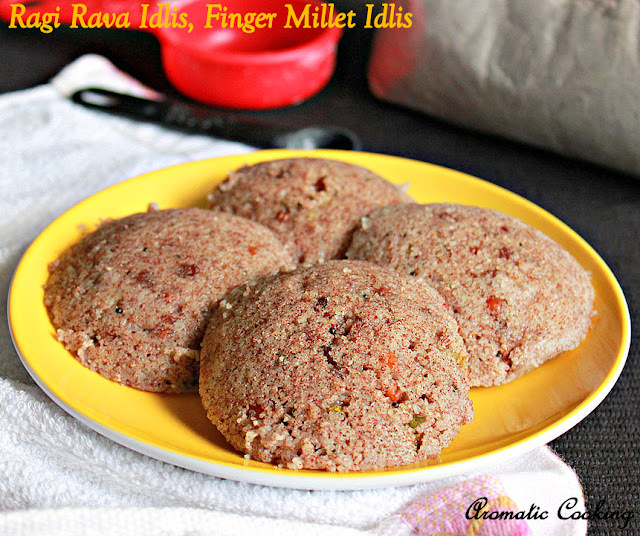 Today's post is another healthy and delicious idli with millets, Ragi Rava Idlis. I have made idlis with millets, both instant and fermented versions and for this Ragi Rava Idli, I have used ragi flour/finger millet flour and semolina/sooji/rava. 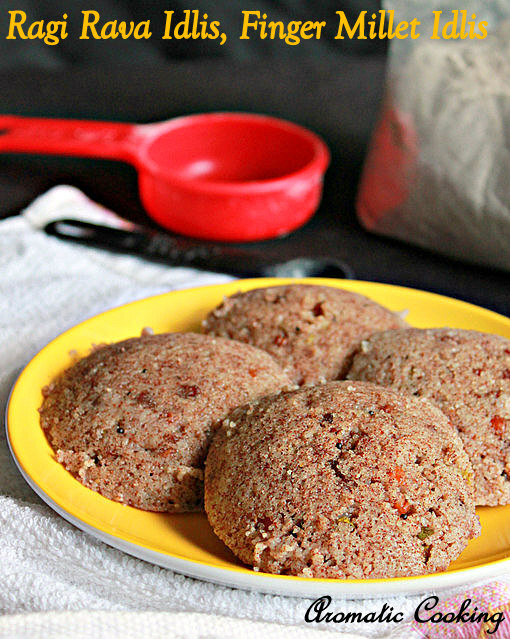 The first time when I made these idlis, I used ragi flour and semolina in the ratio of 2:1, say for 1 cup ragi flour, I used 1/2 cup semolina, but I didn't like the texture of the idlis, they were dense. Only on my third try, I was fully satisfied with the idlis, I used equal quantities of ragi flour and semolina and the idlis came out really good and had the perfect rava idli texture. Serve them with some tomato chutney or tomato thokku for a filling and delicious breakfast or dinner..
Heat 5 teaspoons of oil, add the cashews, chana dal, urad dal and mustard seeds, when the seeds start sputtering and the cashews and urad dal turn golden, add the asafoetida, green chilly, ginger and curry leaves and saute for 1/2 a minute. Then add the rava/sooji and roast for about 5 to 7 minutes on medium-low heat and then add the ragi flour. Mix and roast for another 3 to 4 minutes and remove. Now add the yogurt and 1/2 cup of water to the roasted flour mixture, mix and leave it for about 5 minutes. In the meantime, grease the idli molds and heat some water in a steamer. After 5 minutes, add the salt, coriander leaves and another 1/3 to 1/2 cup of water and mix, the batter should be thick. When the water starts boiling, add the eno/fruit salt to the batter, mix and immediately add it to the idli molds and steam it for 15 to 18 minutes, till the idlis are cooked. Switch off, remove the idli mold from the steamer, let it cool for a 3 to 5 minutes and then remove them with a spoon dipped in water. Add the eno/fruit salt and immediately steam the batter, if you can't find eno, you can add baking sodain its place. After the flours are soaked in curd and water for 5 minutes, the second time when we add water, I have given as 1/3 cup to 1/2 cup, you will need the 1/2 cup, but just don't dump all the water, sometimes depending on the thickness of the yogurt, you might need a little less or more. You'll get 16 idlis for the above quantity. They are healthy and delicious! Can we skip fruit/eno salt?? No, eno/fruit salt gives that light and fluffy texture for the idlis, because these idlis are instant and not from fermented batter.